Whether you’re a soldier who’s just entered the rough working world or one who’s been through the NAMA Boot Camp drill before, enlist in this all-new program today to learn more about the agri-marketing industry. The 2006 NAMA Boot Camp will take place August 22-24 at the Hyatt Regency Crown Center in Kansas City. All attendees will receive a notebook packed with ag terminology and facts as well as case studies and speaker presentations. Special thanks to Fastline Publications for sponsoring this resource notebook. Experience a wide range of working agricultural operations first hand on the MoKan Ag Tour. This tour will depart from the Hyatt at 8:30 a.m. on August 22 and will stop first at the Kansas City Board of Trade. Next, you’ll visit a purebred beef operation (Tailgate Ranch), diversified family farm (John & Karen Pendleton’s), followed by an agricultural equipment company (Heritage Tractor). The tour will return to the hotel by 4:00 p.m. and includes lunch and refreshments. 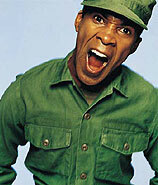 And, it’s priced separately, so you can add it to your Boot Camp registration or, just attend the tour. Hear first hand how to effectively communicate with the end user. This panel will feature a diverse group of producers from across the country and will be moderated by Dallas Ford with Alpha Scouts. You’ll hear from a speaker from USDA Rural Development the ins and outs of Ag Policy. This session will focus on what Ag Policy means to you, your job and your client or company. Step into a producer’s boots without having to head to the farm. From field preparation to harvest and calving to risk management, these sessions will cover the events a producer endures throughout the year. Relax over lunch and learn more about this segment of the industry. This light and upbeat session will be presented by Dr. Gene Brown, director of the Center for Direct Marketing, Education and Research, The Henry Bloch School of Business at the University of Missouri-Kansas City. Are you an in-house marketing department or do you find yourself functioning as one? This session will provide an overview and valuable tips for getting the job done. Working with checkoff boards is a whole different ball game. This session will focus on strategies and tactics for communicating and working as a team with these boards. Learn how to develop an understanding of key activists groups, common motivating factors in consumer activism, organizational dynamics in activists’ communities and the tactics used to address issues. Moderator: Jim Gresham, Adculture Group Inc.
Wrapping up the Boot Camp, this session will focus on the future and what it holds for the agri-marketing industry. Register online now at https://nama.org/programs/bootcamp-register.htm or register by calling the NAMA office at (913) 491-6500. If you are interested in sponsoring a session or event at the NAMA Boot Camp, please contact Eldon White at (913) 491-6500 or via e-mail at eldonw@nama.org. Do you know a fellow NAMA member who has had outstanding acheivements in the areas of marketing communications, product/species management, public relations or sales? If so, nominate them for the 2006 Professional Development Awards of Excellence. These awards will be presented at the 2006 Agribusiness Forum, November 14-15, at the Hyatt Regency Crown Center in Kansas City. Remember, NAMA chapters may operate the program locally and submit chapter recipient(s) to the national level or nominate a candidate(s) directly for national consideration. Individuals may also nominate candidates. The deadline for submitting nominations is September 1. If you have any questions regarding these awards, please contact Eldon White at eldonw@nama.org. Ever wonder who to contact when you change addresses? If you have moved, please let us know of your new address so that all NAMA information will be sent to the correct address. To change your address and the way it’s listed in the NAMA on-line membership directory, simply log-in to the directory at http://www.nama.org/directory.htm, and click on the “submit change” button to change your information. When you first sign up for your NAMA membership, your address is given to AgriMarketing Magazine so that you receive their subscription for free. However, if you move, not only will you need to change your address with NAMA, you will also have to change your address with AgriMarketing. Changing your information with NAMA only will not change the address to which the magazine is sent to you. To change your subscription address with AgriMarketing, please visit, http://agrimarketing.com/renew and click on the “address change” link. You CANNOT change the name on the AgriMarketing subscription. 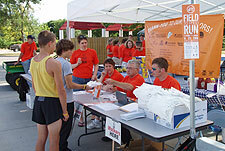 The 2006 Field to Food Run, organized by the Iowa NAMA chapter, was a successful event with strong participation from runners and volunteers. A beautiful 70 degree summer evening provided a perfect setting for the 106 participants who completed the 5K Run in Johnston, IA on Friday, June 23. 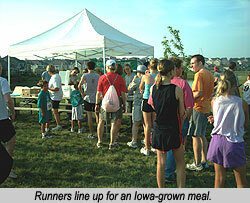 The Field to Food Run is a unique race in central Iowa. It starts in the corn and soybean fields at Pioneer Hi-Bred International, winds through the city streets and finishes in the parking lot north of the Hy-Vee Food Store in Johnston. The even is designed to increase awareness about the interdependence of food production from our Iowa farm fields to the quality of food products consumers enjoy from our grocery stores. At the finish line, several Iowa NAMA members along with several Iowa FFA and Farm Safety 4 Just Kids volunteers participated in providing an “Iowa grown” meal for runners and their families. The meal included pork patties, beef patties, soy nuts, yogurt, chips, fruit, orange juice drinks and hostess cupcakes. Food items were donated by: Iowa Beef Industry Council, Iowa Pork Producers Association, Lee Seed Company, Wells Blue Bunny, Anderson Erickson, Crystal Clear, Cookies BBQ and Steve and Carol Vinton Farms. Prizes were presented to the top male and female finishers in each age category as well as the top three overall winners among men and women. Prizes for the Run were donated by Garst Seed Company, Solutions, Inc., Iowa Corn, Iowa State Fair and Living History Farms. For the past 11 years, the Field to Food Run has generated over $50,000 in donations for agriculture related causes. This year’s benefactors included two non-profit organizations, The Iowa FFA Foundation and Farm Safety 4 Just Kids. Funds given to Iowa FFA Foundation will support the Food Science and Technology career development event and Enrichment Center. Proceeds given to Farm Safety 4 Just Kids will support their efforts to promote a safe farm environment to prevent health hazards, injuries and fatalities to children and young adults. The success of the Field to Food Run would not have been possible without the support of our corporate sponsors, Garst Seed Company, Pioneer Hi-Bred International, DeeZee Manufacturing, Successful Farming, John Deere, Solutions, Inc., Cookies BBQ, Kent Feeds Inc., Agri-Access, Midwest Coaches, Midwest Seed Genetics, Van Wall Group, Vermeer, Two Rivers Marketing, Fitness Sports, The Nest, Denny Elwell Company and Stine Seed Company. Their generosity and support allow us to promote the importance of Iowa agriculture to a consumer audience in a fun and distinctive way. A special thanks to the 2006 Field to Food Run committee who invested many hours of planning to ensure a successful event. Committee members included: Doug Reynolds, Solutions, Inc.; Carrie Jorgensen, McCormick Company; Joe Baitinger, Farm Market ID; Louann Hausner, John Deere; Roxi Beck, Osborn & Barr Communications; Cortney Malter; Pioneer Hi-Bred International; Steve Bobenhouse, Fitness Sports; and Stephanie Vinton, 2006 Field to Food Run Chair, Agri-Access. Region IV hosted their Leader Workshop on Monday, July 10 at the offices of Rhea & Kaiser Marketing Communications in Naperville, IL. During this interactive workshop, topics focused on membership recruitment for the chapters, finding new leaders, and programming for the upcoming year as well as on the regional Best of NAMA awards ceremonies held in January. Attending the workshop were: Ellen LaRose, Region IV Director (Morgan&Myers); Kenna Rathai, Region IV Director (Rhea & Kaiser Marketing Communications); Tom Breunig, Badger President (The Thomas Group, LLC); Meg Gatti, Mid-America President (Fastline Communications); Amy Bradford, Heartland President (Farm Credit Services of Illinois); Kim Lynch, Chicago President (Rhea & Kaiser Marketing Communications); and Julia Goebel, Chicago Regional Awards Chair (Rhea & Kaiser Marketing Communications). Special thanks to all of the chapter leaders who attended the Leader Workshop!